New World’s tallest man: Ukrainian beat Chinese guy by 8 in. In one of my posts about Bao, one of the readers, Natalie, commented telling that he is not the tallest man in the world. I searched for the man and found that he is a shy guy and would not let people measure his height. I collected some of his photos and was going to post about the man, but today I got news that he is indeed 20 cm. taller than the Chinese man. 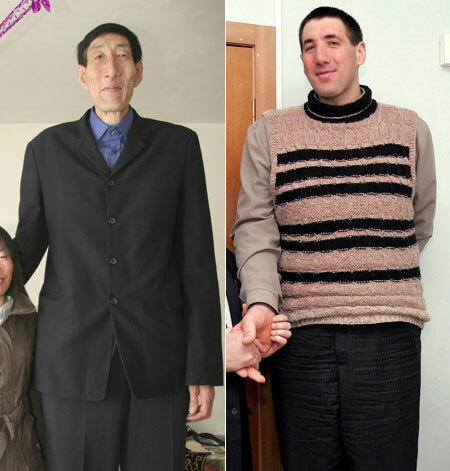 The Chinese hero Bao Xishun loses his title as a Ukrainian vet is decleared officially the tallest man in the world. The Guiness Book of World Records decleared Leonid Stadnik, 36, who lives in a small poor village in northwestern Ukraine, is 2.57 meters (8 feet and 5.5 inches) tall the tallest man in the world. Stadnik is more than 20 centimeters (8 inches) taller than the former title-holder/fallen hero Bao, who measures at a stumpy 2.36 meters (7 feet and 9 inches). Stadnik’s growth spurt started at age 14 after a brain operation apparently stimulated his pituitary gland. At 6’2″ i’m always bummed out when I run into people taller than I. Of course it happens all the time, but I can’t imagine what it’s like to meet some one 2’6″ taller than I! how is this possible for this to get that tall. how old are both of you.